Movie: "Honey, I Shrunk the Kids"
Professor Wayne Szalinski has been working on his new invention, a shrink ray, in his family's home for quite some time. When their neighbor hits a baseball into his lab, it activates the laser. When their two kids and the neighbor's two kids go to the lab to retrieve the ball, they are accidentally shrunk, get thrown out with the trash, and must brave the dangers of the backyard so they can get home and be returned to normal. There are quite a few movies about shrinking people, some of which date back to at least the 1950's. In 1989, Walt Disney Pictures decided to make a shrinking person movie of their own. 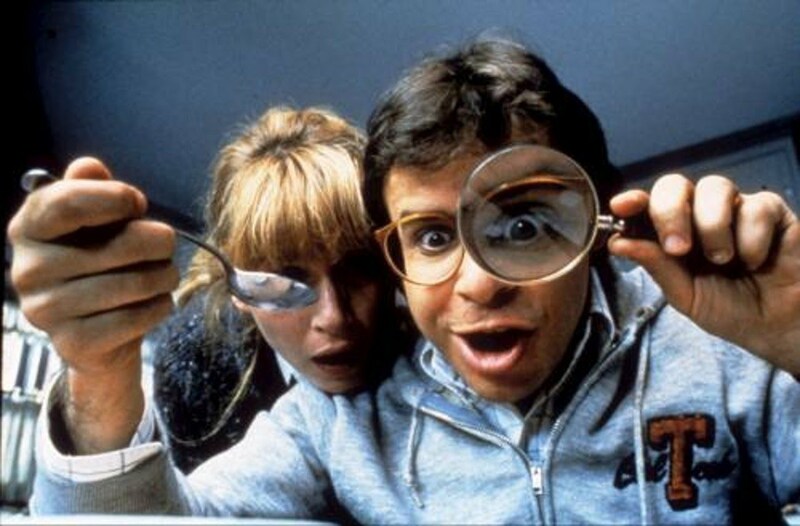 "Honey, I Shrunk the Kids" marks the directorial debut of Joe Johnston, who would go on to direct films like "The Rocketeer," "Jumanji," and "Captain America: The First Avenger." It is written by four different writers, though oddly enough three of them, Ed Naha, Brian Yuzna, and Stuart Gordon, are known more for their backgrounds in the horror genre than family comedies. It makes sense in a weird way since the "shrunken person" genre started off as a horror/sci-fi-heavy topic. The film stars Rick Moranis as Professor Wayne Szalinski, an inventor who has been working on a shrink ray. One day, one of the neighbor's children hits a baseball through his laboratory window, activating the shrink ray. 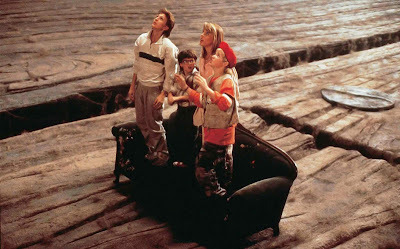 When the Szalinski's kids Amy and Nick (Amy O'Neill and Robert Oliveri) take the neighbor kids Little Russ and Ron (Thomas Wilson Brown and Jared Ruston) to retrieve the ball in their dad's lab, the ray goes off, shrinking all four of them instantly. When Wayne accidentally sweeps the kids up and throws them away with the garbage, they must journey across the perils of their backyard to return home to be re-enlarged. 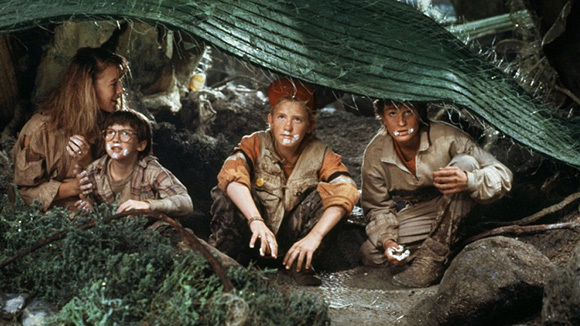 The 'shrunken kid' premise of "Honey, I Shrunk the Kids" allows director Joe Johnston to turn what would be a mundane trip across the backyard into a wild jungle adventure. The kids face perils like bumblebees, scorpions, sprinkler systems, and lawn mowers. These objects are merely minor inconveniences as full-sized human children, but when shrunken to a teeny tiny size, these trivial nuisances become gigantic monsters, immense rivers, devastating landslides, and giant tornado-making death machines. The special effects make this movie as successful as it is. The effects team did a great job creating the illusion of diminutive size through the classic use of forced perspective, as well as sets featuring massively oversized blades of grass, LEGO bricks, oatmeal cookies, etc. They also used stop-motion animation to create the giant bugs that fight and petrified us all as kids. We really enjoy the comedy in this movie as Rick Moranis frantically tries to find ways to locate his tiny kids without accidentally crushing them. His bizarre antics make for a lot of laughs. All of the child actors do a solid job selling their harrowing adventure and all the dangers that come with it. 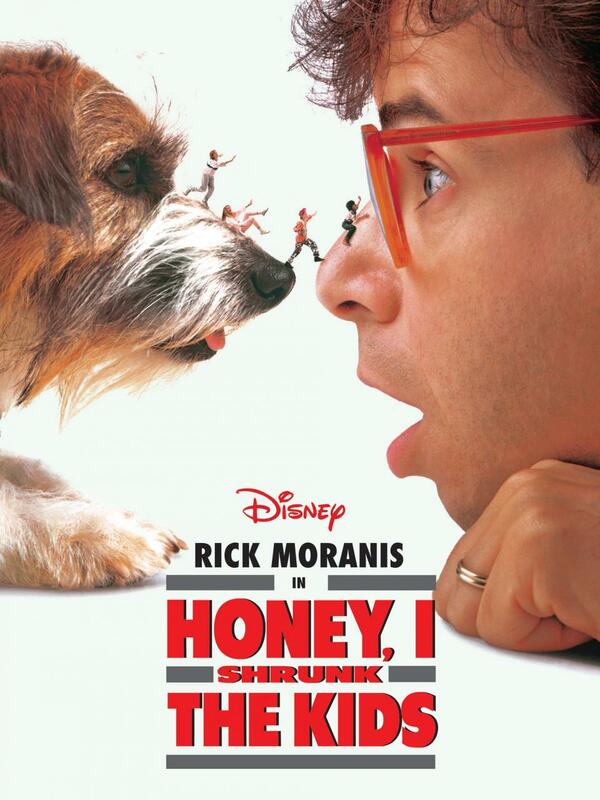 Overall, "Honey, I Shrunk the Kids" makes for a fun and exciting watch, even nearly 30 years later. We believe it holds up quite well. Sure, cynics who do not like joy could spend their time picking apart some of the not-so-scientific aspects of it and argue about size incongruities until the cows come home, but if you can suspend your disbelief for long enough, you may find that you still enjoy this comedy adventure in all of its zaniness.